David Lynch is one of the most intriguing film directors of the modern era. From arthouse masterpieces to big budget sci-fi epics, Lynch manages to stamp his own style into every frame. It is hard not to watch a Lynch creation and feel his presence, something which not too many other directors can boast of. The evolution of Lynch's work is quite interesting, as the advent of online content delivery and digital film making has created a direct segue back to his artistic roots. As known mainly by Lynchphiles, David Lynch has always considered himself a visual artist first and foremost. From an early age, Lynch's work began to be shaped by his unique view of the world around him. His early works of note were just as much boyhood experiment than purposeful artistry. Particular mention must be made of his "Fish Kit", where Lynch took apart a fish as it were a model kit and created a display of the necessary pieces required to assemble a fish. From such an example, Lynch's skewed take on the perception of reality and Art began to take shape. It is this raw, subconscious creativity which Lynch has become famous for tuning into. Interviews and biographies are replete with Lynch talking about ideas, where they come from and what to do with them. The process of creativity seems a very primordial one for him, as humans respond to urges and unquantifiable forces which materialise as images and sounds in the mind. It is then the job of the artist or film maker to make something useful of it. Whilst a young Lynch did head off to Europe to attempt a more formal training in art, this was never to be. Eventually Lynch returned and found himself in Philadelphia. Oozing with vice and crime, the Philadelphia of the 1970s terrified Lynch, and helped form the dark vision which was to shape his first major piece - Eraserhead (1977). Completed over a period of 5 years, and shot when the cast, crew and equipment were essentially not otherwise occupied, the film became a popular item amongst Indie film goers. The bleak look and sound design of the film resonates with Lynch's level of discomfort whilst in Philadelphia. Also, Lynch's readiness to detour into the surreal or dream state was quite evident from even this early on - the most notable of these in Eraserhead being The Lady in The Radiator. Of all persons that could have helped propel Lynch from art school film maker to mainstream director - it was funnyman Mel Brooks that is credited with giving Lynch his first shot at fame. Brooks was producing a film about Joseph Merrick, a tragic figure of the Victorian era. 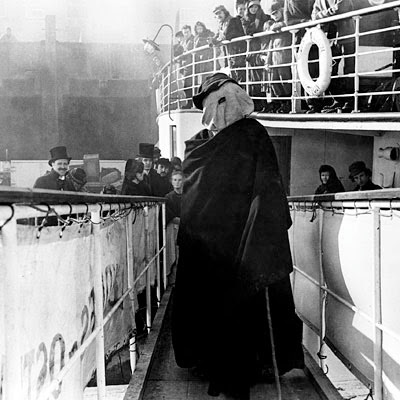 Ridiculed and exploited due to his medical deformities, Merrick became known as the 'Elephant Man' but went onto capture the public imagination when it was discovered he was a man of compassion and intelligence. Brooks wanted someone who could do a dark and gritty Victorian England, and after watching Eraserhead, the famous call was made to Lynch, "David, I think you're nuts, but you're hired!" Lynch soon found himself among Anthony Hopkins, John Hurt and Sir John Gielgud - something which would make even the most experienced of directors balk - let alone a 34 year old doing his first mainstream piece. To say it was a daunting experience would be a tremendous understatement, but Lynch persevered, adapted and learnt - and in the process made one of the most remarkable films in the history of cinema. In fact, The Elephant Man (1980) earned Lynch his very first Oscar Nomination for Best Director - though he was not successful. Lynch's next found himself embroiled in his most complex project to date - entering production of Frank Herbert sci-fi classic Dune (1984). Perhaps doomed from the start, Dune turned out to be a trying experience for Lynch. In interviews he often describes the project as an unmitigated disaster, though fans of Lynch are far more forgiving. Lynch's Dune still manages to carry his trademark style and cadre of favourite actors. Lynch himself even makes a cameo as a miner. Most of Lynch's ire with Dune stems from the butchering the film was given by producers. Several versions of the film were released, including a three hour extended TV version. Lynch was so upset with having his final cut altered that he rescinded his directorial credit to all but his original version. Lynch was now able to start to shape his own style. He both wrote and directed his next film, the 'psychological thriller' Blue Velvet (1986), starring Isabella Rossellini, a young Kyle Maclachlan and Laura Dern, with an unforgettable performance by Dennis Hopper. Blue Velvet unfolds like a nightmare - an uneasy start, with increasingly menacing places and people as one gets deeper involved. The film features some mind bending sequences of violence, drug fueled frenzy and Dean Stockwell miming to Orbison whilst arranging a drug deal. Blue Velvet earned Lynch his second Oscar Nomination, though he was unlucky again. It was no surprise that Lynch earned the moniker "Jimmy Stewart from Mars." With each project Lynch seemed to have no problems delving deeper into the human psyche and tearing out the strange and scary bits and putting them on screen. Whilst doing this however, he himself has remained a quiet and unassuming character - who once admitted he has a 'whiff' of agoraphobia. As interesting as Lynch's career had been until this point - he truly entered the hearts and minds of an international audience with his next project - TV series Twin Peaks. The mystery of 'Who Killed Laura Palmer?' captivated audiences. With Lynch present for most of the first series, many of the episodes maintained his distinct signature symbolism. Indeed, Lynch himself appeared in an ongoing cameo, the very cool but quite deaf FBI man Gordon Cole. 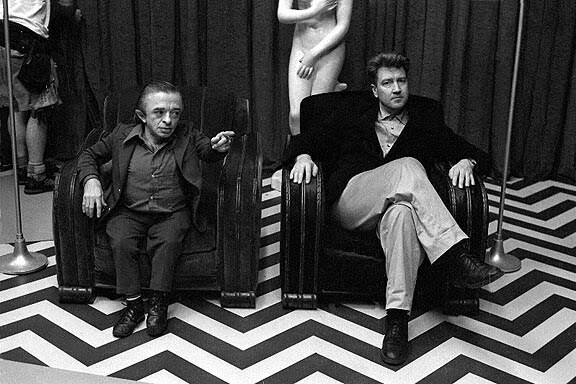 One of the most famous scenes in TV history was delivered at the end of the Twin Peaks Pilot. 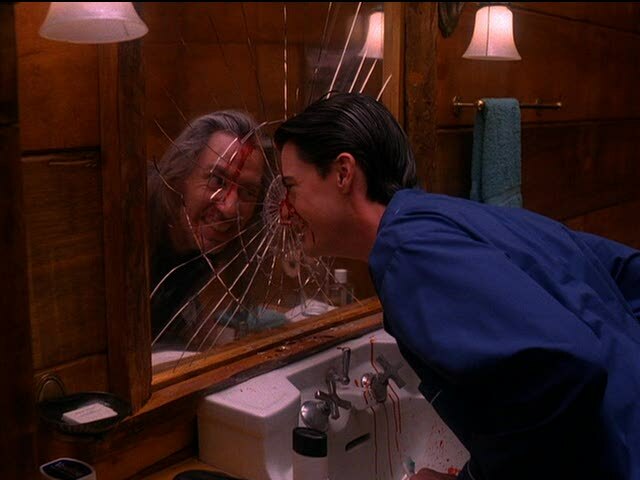 In it Lynch portrays a dream sequence experienced by Special Agent Dale Cooper. A room enveloped in red velvet drapes, and distinctive zig-zag floor patterning. A statue of Aphrodite sits behind a couch and a dwarf speaks cryptically in an unusual cadence. This effect was achieved by actors performing movements and reciting their lines backwards and the film played in reverse to restore normal speed. I distinctly remember watching this sequence for the first time during its local TV premiere. We all watched, transfixed, confused and enthralled. As Cooper wakes from his dream and the episode ends, the public imagination soon became afflicted with Lynchmania. The sequence itself has been emulated, spoofed and queried profusely by fans, critics, psychologists and anyone else that happened to see it. My favourite Lynch anecdote associated with this scene is his own description that the idea of 'The Red Room' came to him when he was leaning on the warm bonnet of a car. Whilst this is an archetypal example of Lynch's ability to make himself an antenna for such ideas - inspiration for the sequence isn't too hard to find. The most obvious of these was Scottie Ferguson's dream sequence in Alfred Hitchcock's Vertigo (1958). In fact, Lynch makes a quite obvious homage to Vertigo, naming a character in Twin Peaks(Madeleine Ferguson) after Kim Novak's and Jimmy Stewart characters. Although Twin Peaks' original story arc came to an end by episode 13, the series went on, quite often without Lynch present. In this part of the series, Twin peaks lost much of its Lynchian allure, though was still captivating due to the unique characters established in season 1. Lynch's absence at this time was due to his filming Wild At Heart (1990) - a torrid love story based on a story by Barry Gifford and starring Nicholas Cage and Laura Dern. Wild At Heart is an amazing film, and has some remarkable Lynchian symbolism, mixed in with the violence and quirkiness of Gifford's characters. Lynch returned to direct the final episode of Twin Peaks. Confusing to many but beloved by Twin Peaks and Lynch fans, most of this episode takes place between The Black Lodge - a place of evil containing the inhabitants of The Red Room from the original Pilot episodes. 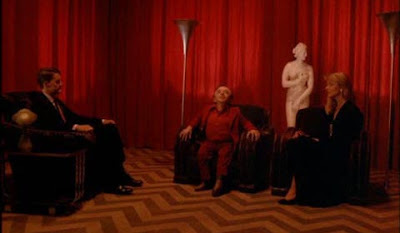 The symbolism of the Lodge and Lynch's obsession with duality is reserved for another discussion. Needless to say, the series concluded with the dramatic revelation that Agent Dale Cooper was about to start on a murderous rampage himself. Unfortunately for fans, even though Lynch did revisit Twin Peaks in his next film, Cooper's immediate fate was never revealed. Feeling Laura's story was incomplete, Lynch wanted to finish off Twin Peaks, and chose to do so by making a prequel depicting The Last Seven Days of Laura Palmer. Indeed, this is what the film was called in many countries, but was released in US as Fire Walk With Me (1992). A three hour print was presented at Cannes, and after it's poor reception - a two hour version was refashioned for mainstream theatrical release. The cut hour of footage has since become the stuff of legend for Twin Peaks fans, for which a continuing campaign for DVD release has existed for over a decade. I will come back to Fire Walk With Me at another date - it is truly Lynch's magnum opus in many ways. That being said, it isn't easy to stomach for those uninitiated with Lynch and the Twin Peaks universe. From this point, Lynch began to further indulge his artistic roots, presenting art, photography and sculpture across Europe and the US. Lynch's next major film Lost Highway (1997) took his obsession with duality to the extreme - portraying the psychiatric phenomenon of a fugue affecting a man who has killed his wife. Another collaboration with Barry Gifford, the film stars a steamy Patricia Arquette and features cameos by Richard Pryor and David Lynch's own home. The most memorable performance is Robert Blake's spectral presence as 'The Mystery Man" - in particular the famous ''call me'' scene. After a detour into Disney with The Straight Story, Lynch began work on another TV series called Mulholland Drive. The series never got off the ground, but following some funding from French Distributors Canal, it was turned into a feature film. Interestingly, by filming an extra 30mins, Lynch turns a pilot for a mystery story into manifest dream - where idealistic actor Betty dreams her perfect life, only to awake to reality and notice that none of her dreams have come true. Despite confusing many mainstream film goers, Mulholland Drive (2001) earned Lynch his third Oscar Nomination - but again missing out - this time to Ron Howard and A Beautiful Mind. A lot more has been, and can be written about this unique creative force. For those that have not seen any Lynch films, I would recommend watching them in the order they were made(as presented here). By doing this you can track Lynch's development and identify the common motifs that carry through most of his work. This will make deciphering each subsequent film easier. For a great read, the book Lynch on Lynch (rev. 2005) is a fantastic resource if you want to hear about the creation of these films from the man himself. Finally, for a glimpse into the world of Lynch as an artist, please watch this wonderful interview with Lynch by art scholar and author Andrew Graham-Dixon, as seen on an episode of The Culture Show in the UK. ...so I finally got around to checking out your blog. Anyhow, this is well written and very insightful, and I will definitely keep reading your blog. cheers Pieski!! I have a soft spot for Dune. It is so unmistakably Lynch in spots, and seeing this in a sci fi context is something that only happens once. Actually, there was a fan edit of Dune by spicediver that rounded the story out a bit more, though not over saturating it like the 3 Hour version... worth checking out IMHO.